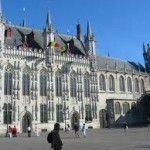 Book your hotels in Bruges cheap, safe and fast with BookYourHotel.org! 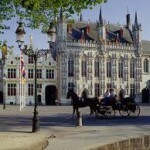 The City Hall in Bruges is one of the oldest in the Lowlands: in 1376 construction already started. For over 700 years the City of Bruges is being controlled from this late-Gothic gem. The building has a rectangular ground plan, corner towers and a high gable roof. The impressive, rich design clearly reflects the economic prosperity of Bruges in the 14th century. 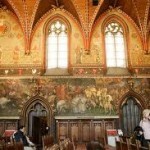 The most famous room in the City Hall of Bruges is The Gothic Chamber, with its magnificent 19th-century historical murals and polychrome vault ceiling, a true joy to behold. 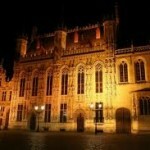 The City Hall of Bruges is a true must for anyone visiting Bruges!